Update of all Astropulse applications to support AP v6.01. Tick or untick CPU AP and MB applications as desired. Tick CUDA MB if desired. The installer is supposed to shut down the BOINC client whilst leaving the Manager running - noticable from the red 'disconnected' dot in the tray. After finishing the BOINC client should restart and the red dot vanish when the Manager reconnects. This make take a few minutes. On some systems however this fails to work. Please ensure BOINC has restarted. If you have any doubt at all about what instruction sets your CPU supports, download CPU-Z from http://www.cpuid.com/softwares/cpu-z.html You will usually find that the SSSE3x application is fastest on the Intel processors which support SSSE3x, except on dual-core CPUs with especially fast memory subsystems,where SSE4.1 may be faster. However, we have an indication, that on Intel i3, i5 and i7 processor series SSE3 may be the fastest variant at most angleranges. The effect is smallest with VHAR (shorties). The new r555/r557 AP applications support AP v6.01 and v5.05 work. If your CPU is only capable of SSE choose the r555 SSE application. If your CPU supports AVX (Intel Sandybridge and AMD Bulldozer, Windows 7 SP1) choose the r557 SSE2 build as it is faster. If you have a CPU with SSE2 and above but not AVX the r557 MAY be faster. We have indication that on most hosts r557 is faster but no guarantees. Download drivers from http://www.nvidia.com/Download/Find.aspx?lang=en-us (or your national equivalent). We recommend you avoid driver versions 295.73 and 296.10, which are not supported at some other BOINC projects. Actual free memory required is in the region of 200-235MB, depending on driver and OS flavour. In this case, there may be a BOINC bug putting the app in an infinite loop while it waits for more memory. If in doubt ask for help on the SETI Number Crunching forum. To multithread on Fermi cards, find all instances of <count>1</count> in app_info.xml and decrease to 0.5 or 0.3 to run two or three tasks in parallel. x41g has improved reliability, stability and accuracy over x38g. x41g_cuda32 has been tested with and is safe to use on Kepler. plain - for most HD4xxx owners and those with HD5xxx and HD6xxx cards who suffer from driver incompatibilities. HD5 - for most if not all owners of HD5xxx GPUs and HD6xxx GPUs. It will, however, probably work on HD53xx & HD63xx with workgroup size 128. If you have problems running the HD5 flavour (anything from reduced performance to BSOD), you should run the plain variant. On most systems GPU-Z (see above) will tell you if your setup supports OpenCL. Minimum required driver: Something that is OpenCL capable. You can check with GPU-Z (see above). On some drivers the app shows increased CPU usage. Drivers from 11.12 onwards work. First official driver for HD7xxx is 12.3. For cards without OpenCL support (from HD2xxxx on) use the 'hybrid' r555 Astropulse application. NB this is a combined CPU/GPU application and will only use the GPU for some of the calculations, while doing the rest on a CPU core. NB using this installer will give you arbitrary default cmdline parameter entries. If you are already running ATI applications: Make a note of what numbers you are using to be able to restore to those values PRIOR to running the installer. The Hybrid AP application uses about 80% of a CPU core and does only about 20% of the calculations on the GPU. Parameters have been choosen to reflect this usage. 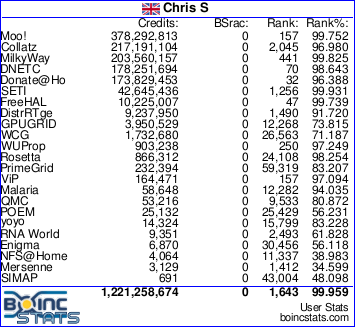 However present BOINC can not reserve '0.8' of a CPU core and therefore reserves none. This means your CPUs will be overcommitted and runtimes and DCF will suffer. You do increase the overall output though. -instances_per_device N how many tasks you want to run in parallel. Inverse of <count>. -unroll 4 Optimal at half the number of Compute Units of the GPU. Lower values also reduce VRAM use. Decrease if you experience lags. ffa_block should be divisible by ffa_block_fetch. Going too high will result in premature 30/30 exit errors. -period_iterations_num 20 splits calls into smaller portions. Increase if experiencing lag. With Windows Vista and Windows 7, do not install BOINC in 'Service' or 'Protected Application Execution' mode for GPU crunching, and do not connect to a Vista/7 computer with Windows Remote Desktop while it is running a GPU application. Switching users can also cause the GPU app to fail [BOINC versions before 6.12.28]. For AP: If you get lags or worse driver restarts, decrease unroll. If you run stable you can try to increase it. ffa_block should be a multiple of ffa_block_fetch. Start low e.g. -ffa_block 4096 -ffa_block_fetch 2048 and try increasing if it runs fine. Sticking to the power of 2 line at first can help. There will be a system specific best combination - too low slows you down, too high slows you down as well. Remember AP runtimes depend on blanking % so only compare runtimes on similar blanking %. Thanks go to Jason and Raistmer for their continued work to improve applications and to Josef W. Segur for invaluable help with everything. Claggy, Jamie, arkayn and Mike. Message 1210315 - Posted: 26 Mar 2012, 15:21:21 UTC - in response to Message 1210310. And a heads up for those running Boinc alpha clients. We've had reports that the ATI AP app dies when you suspend it on Boinc 7.0.22/.23. Are there any indications that the r557 AP application can actually run SLOWER than the r555 on a SSE2, non-AVX processor? No, r557 shoud be faster. Message 1210334 - Posted: 26 Mar 2012, 16:19:47 UTC - in response to Message 1210330. 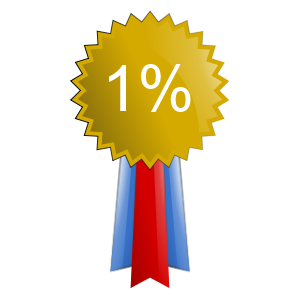 I actually did that test on a Pentium4 (Northwood CPU - very small L2 cache). We use artificially shortened tasks for testing - in some cases 555 was quicker, in others 557 was. There wasn't a lot in it, either way. what we would do without you ? Does the 0.40 installer do the v7 mb wu? I didn't see any reference in the app_info.xml file. Message 1210343 - Posted: 26 Mar 2012, 16:35:15 UTC - in response to Message 1210310. Just double-checking... Is it OK if I don't install this, since I'm not doing Astro ATM? Message 1210345 - Posted: 26 Mar 2012, 16:39:23 UTC - in response to Message 1210341. MB V7 has not yet been released to Main! Message 1210346 - Posted: 26 Mar 2012, 16:40:11 UTC - in response to Message 1210343. Message 1210361 - Posted: 26 Mar 2012, 16:56:47 UTC - in response to Message 1210334. He is running AMD Phenom with large cache. Could this be made a Sticky Thread please ? Message 1210381 - Posted: 26 Mar 2012, 17:55:06 UTC - in response to Message 1210379. I rather suspect that as long as the need is there, it shall stay active enough to remain near the top of the thread list. The 'Optimised Applications' announcement thread is kept locked and sticky, so it's always in the top half-dozen threads here. There is a direct link to this thread, should people need it. You can even find the v0.39 release notes that way, even though in under four months, that thread has slipped almost to the bottom of page 5. I think both mods and users prefer to restrict 'stickyness' to the minimum possible number of genuinely significant threads. Message 1210397 - Posted: 26 Mar 2012, 19:13:50 UTC - in response to Message 1210318. Not just AP, but MB on ATI as well. Had that happen a couple of times. Exit code 1, latest crash happened this morning when BOINC suspended itself for time-of-day. Message 1210400 - Posted: 26 Mar 2012, 19:21:36 UTC - in response to Message 1210399.